When it comes to waterproofing your basement, there are both interior and exterior solutions. Both methods are beneficial and meet certain needs depending on your home’s situation. If your home is showing any symptoms of waterproofing issues, our team can recommend the proper waterproofing solution. At Total Foundation Solutions, we have provided exterior waterproofing solutions for customers for over 30 years. Our variety of products will give you a complete exterior waterproofing system to protect your home. What’s the main difference between interior and exterior waterproofing? While they both solve the same problems, it primarily depends on the extent of the water damage as well as the homeowner’s preference. If water has already entered your home, interior waterproofing products would be the best solution. If water has not yet entered your home, exterior waterproofing products would be a viable solution for future protection. We have found that some customers don’t want the intrusion of certain interior waterproofing products and prefer the work to be done outside the home. Although we keep the disruption of interior waterproofing to a minimum, some customers just prefer it to be done on the exterior of the home. Interior waterproofing involves installing sump pumps, interior drainage systems, vapor barriers, waterproof wall panels, and other options. All of these systems work together to protect your basement from water damage. Exterior waterproofing typically involves excavation around your home’s foundation to properly install the waterproofing products. An exterior drainage system is a great way to keep water away from your basement. A complete exterior drainage system is comprised of many different parts that all work together to keep your home protected. Exterior waterproofing systems can be installed during new construction or to existing homes, but it is typically recommended to be installed during new construction to avoid disruption to the existing yard. At Total Foundation Solutions, we know how much homeowners care about their yard. We install our exterior waterproofing systems with minimal disruption and leave your house looking just as it was when we arrived. At Total Foundation Solutions, we use the TUFF-N-DRI® Basement Waterproofing System. It is a flexible polymer-enhanced asphalt membrane that is flexible and applied to provide a minimum 40 mils of protection when cured. A benefit to the TUFF-N-DRI® system is that it is at least four times thicker than typical damp proofing products. Its spray application and elasticity allows it to seamlessly cover foundation cracks and provide ultimate protection against potential for any future cracks. No matter what season it is, the elasticity of TUFF-N-DRI® allows it to withstand any harsh weather conditions for constant protection from water damage. Hydrostatic pressure is no threat to this system as it is extremely durable and designed to protect your home from any outside source. 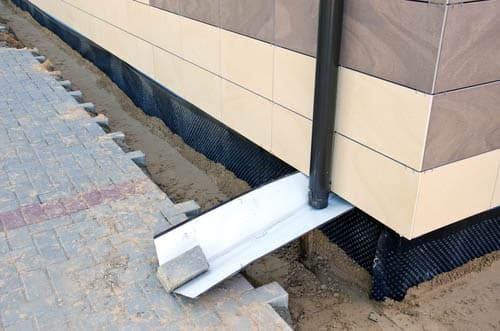 The system also comes with a foundation board, which provides even more protection against the membrane, helps with drainage, provides insulation for your basement walls, and reduces interior condensation. Total Foundation Solutions has served all of Northwestern Pennsylvania and Western New York with exterior waterproofing solutions for over 30 years. If you notice any water damage symptoms in your basement and aren’t sure whether interior or exterior is the best choice, leave it to our experts for a recommendation. We are happy to inspect your home’s situation and answer any questions you may have about waterproofing. Contact us today for your exterior waterproofing estimate!